Thanks to some generous donations and my tax return, I have obtained parts and put together a new server. This blog and a few other minor things are already running on the new machine, though as I write this, most of my other Internet services are still on the old server, saidar. The new server is named frodo. I was going to name it bilbo, but changed my mind after reflection. Frodo is a more mature character than Bilbo, capable of carrying a heavier burden. Internally, the CPU is a full quad-core Phenom II, but sold as a triple-core. This is part of a line of CPU models that allow AMD to sell chips with bad components that would otherwise just get junked. Not all of the chips are actually bad, though – some of them are perfectly functional chips that have had components disabled to sell at a lower price point. Anecdotal evidence suggests that as many as 70% of them are fully functional. The BIOS on this motherboard has the ability to re-enable the disabled components. In addition to enabling all the cores, I have also overclocked it from 2.5 to 3.0 Ghz. It’s been running for over a week now (since 2009-Feb-09) without any issues. I had been planning on doing some full documentation on my wiki of how I’m configuring it, but in the interests of actually getting it done, that hasn’t happened. I have put up some disjointed notes, which I will flesh out and clean up. Unfortunately, using those notes won’t be possible for a novice. If anyone is interested in setting something similar up, I may be able to help out. Such help would be free of charge unless it’s for a business. Today as I was moving my blog to the new server, I discovered signs that the blog site had been tampered with by an outside party. I can’t be sure, but it looks like the tampering may have occurred on 2009-09-03. I think I’ve eliminated the problem. I know that this is going to be no big deal for some of my readers. If you’re reading this, chances are that you have either flirted with or reveled in the Linux desktop. I have flirted with it, but never long enough to print anything. Today I told my server about the printer attached to my Windows machine, then successfully loaded my résumé from my website and printed it. I am excited by this little victory, small as it may be. Be prepared to receive something special in a large package. Could it be more vague? I suppose it could, so I better just be quiet. I will see the new James Cameron movie at some point, hopefully in 3D … but I will be thinking about compassion, honesty, valor, justice, honor, sacrifice, spirituality, and humility when I do. I am in need of a a new shelf for my refrigerator. The glass got broken out of the middle while it was being cleaned, making quite a spectacular sound which all of us except the nimble-fingered perpetrator heard from the other room. My specific fridge model is Maytag MSD2754GRW. The part number for the shelf is 61004024. This is one of the “beverage spill” shelves, common to both Maytag and Whirlpool 27 cubic foot models. I suppose it could be found on other size models, but that seems unlikely. Anyone got the right kind of Maytag or Whirlpool fridge that they don’t need, with an intact shelf I could have or buy for SUPER cheap? We are nearing the end of another year, and I won’t have to go into work for the rest of the decade. It seems only moments ago that everyone I know was sitting at work waiting for the new century and with it the flood of Y2K problems that never came. Was that really ten years ago? I can come up with another scary number describing how long it’s been since high school, which also represents the end of an era. We were the last group to ever graduate from South High. There have been a number of doors opening even as these doors close. My eldest child has gotten her first job, an externship for the Pharmacy Tech college course she is taking through her high school. She graduates next spring. The next younger child is making good use of her learner’s permit, and will probably be ready for the real thing in a few months when that birthday comes around. I hope my wallet can keep up. Her twin sister recently extracted DNA from split peas in her Biology class. The older boy played his trumpet in a Christmas concert and did very well. The youngest is, little by little, starting to get involved in managing his diabetes. All of the kids are very intelligent and learning well. This time of year is rich with milestones for us. Earlier in the month, one of the boys had his 14th birthday. Tonight, we visit family for Christmas Eve dinner. Tomorrow, the kids open their presents and we have a few friends and family over for Christmas dinner. My nine year wedding anniversary and 40th birthday are also coming in the next couple of weeks. I love and appreciate my family. I don’t tell them this often enough, and what I do tell them probably gets lost in my grumpy outer shell. I’ve got five kids that are really a pretty good bunch. I can’t say enough about Kathy, who keeps the house functioning despite a continuous battle with her own body. Thank you, everyone. For various reasons, the birthday party plan I had for New Years eve is not going to work out. This is the way things usually work out for my birthday. I’m not the only one who doesn’t get a proper celebration, though. Kathy’s birthday usually comes while we are at a campground, because it is in the middle of July, which is the ideal time to take school-age children on an extended camping trip. I would like to have a birthday party. On December 30th, I reach forty years outside the womb. Would I get any response to having a combo birthday/new years eve party on the 31st? I’m thinking of a pot luck sort of arrangement. I don’t necessarily want to tell people what to bring, but I would like to coordinate it so… we know what will be there and can be ready to fill any gaps. Comment here or send me a direct message so I can figure out whether this is worth doing. Earlier this evening I was having trouble with USB. All USB devices stopped working, so I could only access the computer via remote desktop. This has happened before, but the usual fix (shut down the computer, unplug it, wait 30 seconds for all power to drain) didn’t work. So then I got back in via remote desktop and removed all USB devices from device manager. That resulted in total failure – they were detected as “unknown device” instead. After a few hours of struggling with system restore and the Intel driver update and getting nowhere, I finally broke down and ran the Windows XP setup that I had long ago copied off the CD and slipstreamed with Service Pack 3. That worked, but then I couldn’t get Windows Update to work. I had to uninstall IE8, reboot, and now it is just finishing up the 57 updates that it required once IE7 was working. Microsoft is not my friend at the moment. Winter is not my favorite time of year. I really dislike the cold. I know that a lot of the reason that I dislike it is because I do not prepare well and am usually not dressed appropriately. On the other side of the coin, I also do not like the heat of high summer. Utah is fairly temperate, but we do get a fair number of days where the temperature goes pretty high or pretty low. If I thought there was any way I could afford to live there, and it wouldn’t make the kids crazy, I would move to somewhere in California where the Pacific Ocean keeps the temperature fairly constant for most of the year, but I don’t think I would live right on the coast. Must the toothbrushes with the small heads all have soft bristles? Why is it that the drugstore thinks that only tiny kids with soft teeth could ever use a brush with a very small head? Anyone know where I could find such a compact head brush with medium bristles? Walgreens was no help. Don’t be overly suspicious where it’s not warranted. A good position and a comfortable salary will be yours. Maybe I’ll go to the CFO’s office and tell him that Master Fung has an urgent memo for him regarding me. Because Master Fung is sensitive to both the economy and the environment, he wrote it on much smaller paper than is typically used. At work, we are replacing our 5.6 meter two-way satellite dish with one that is 7.6 meters in diameter. This dish offers twice the surface area of the old one. So you can get an idea of the scale involved, the yellow ladder inside the cage is 8 feet tall. 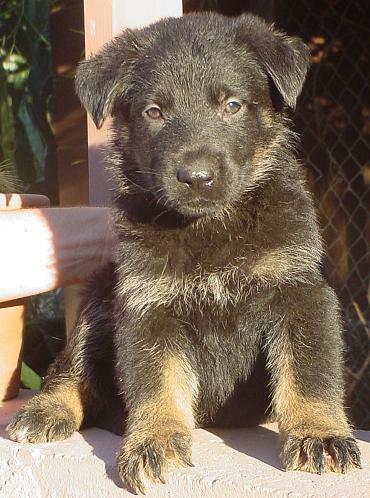 A picture of a german shepherd has been found on the Internet. Kepler looks virtually identical to this one, except that he has very short fur. We decided to re-home Dexter. A beagle is not the dog for us. Now we have picked up a new puppy who’s been with us a little more than a week now. We were told when we got him that he was a 7 week old Australian Shepherd Border Collie mix. We don’t doubt the age much, but we are starting to doubt the breed. We kept getting asked at Petsmart whether he was a German Shepherd. His name is Kepler. We may end up with a bigger dog than we were planning, but he’s such a good animal that we aren’t going to care. Aside from a tendency towards puppy-play-biting, he’s been great. There have been a fair number of accidents as we attempt house-training, but everything we’ve read says that he’s got a long time left before we can expect much in that department. Yesterday we took him to the vet, and he wasn’t sure of the breed either, so we’re going to just watch how he changes as he grows. I’ll get pictures up as soon as I can. Your lucky number for this week is the number five. We got a dog a few days ago. His name is Dexter.